Jimi Hendrix remains alive and well, especially for a man who died 42 years ago. On Tuesday his estate released, “People, Hell and Angels,” a new Hendrix CD featuring 12 previously unreleased tracks, though a few of these have come out in slightly different versions before. That by itself isn’t spectacularly surprising. There have been 11 other posthumously released Hendrix discs starting with “The Cry of Love” in 1971. 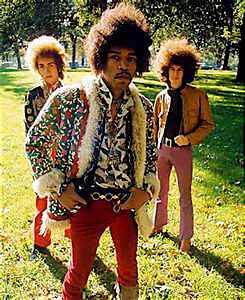 The Experience, from left, drummer Mitch Mitchell, Hendrix and bassist Noel Redding. After the huge success of his first three albums, Hendrix wanted to take his sound and branch out from what had become a confining situation playing along with Mitch Mitchell and Noel Redding in the Experience. It should be remembered that after Jimi was discharged from the Army in 1962, and his development as a professional musician became obvious, he played on the Chitlin’ Circuit before going solo and achieving super-stardom. This was the term given to the loose affiliation of dive clubs and bars in the Deep South, where many prominent African-American musicians cut their teeth performing. Between 1962 and 1966, Hendrix was in the back-up bands for acts like Wilson Pickett, Sam Cooke and Jackie Wilson. He also was guitarist for the Isley Brothers, Ike and Tina Turner and Little Richard, so Hendrix had a solid upbringing in rhythm & blues and early rock-n-roll. 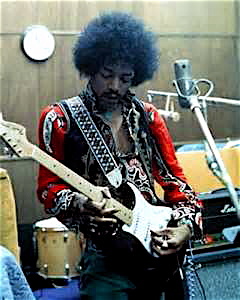 But Hendrix was a force of nature that could not be contained. These early bandleaders were extremely restrictive, especially in the South. African-Americans still didn’t enjoy full social freedoms by any means, but one thing they could control was how their bands were run. 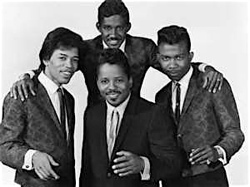 Hendrix, far left, in LIttle Richard’s band. Make no mistake, the guy fronting the band made the lion’s share of the profits. He wanted the backing band to show up at very particular times, wear cheesy uniforms, travel on breakneck schedules, and play the songs precisely how they were recorded for as little compensation as possible. As you can imagine this didn’t sit well with Hendrix. He caught a lot of grief for blowing out his guitar solos and improvising when playing live – which would take a bit of the spotlight away from the bandleader. That being said, Hendrix took away from his time on the Chitlin’ Circuit a huge repertoire of rhythm and blues chops. This new album was originally intended to be titled “First Rays of the New Rising Sun,” prior to Hendrix’s death from an accidental barbiturate overdose on September 18, 1970, but that title ended up getting used on a 1997 release that included a couple different versions of these same songs. 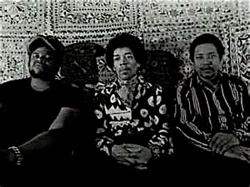 Band of Gypsys, from left drummer Buddy Miles, Hendrix and bassist Billy Cox. 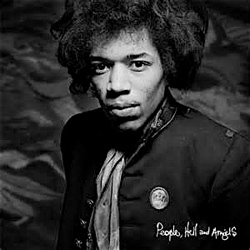 The majority of “People, Hell and Angels” was cut with his Band of Gypsys lineup that came together in 1968 during the escalation of the Vietnam War and the Civil Rights Movement. It features Billy Cox on bass, a buddy of Hendrix’s from the Army, and Buddy Miles on drums (formerly with Wilson Pickett and the Electric Flag). Hendrix re-emerged with a sound that mixed 1960s era rock-n-roll, with psychedelic experimentation, that was tempered with a slowed down rhythm and blues flavor. It’s bizarre, but the initial single released from “People, Hell and Angels” entitled “Somewhere” went straight to No. 1 on the Billboard Hot singles chart in February 2013. Engineer Eddie Kramer, who recorded most of Hendrix’s music during his lifetime, is behind the boards again here, and has indicated this will be the last Hendrix album to feature unreleased studio material. Although several additional live recordings will be coming out in the years to come. These tracks on “People, Hell and Angels” may be 45 years old, but all the Hendrix masters were recorded on analog tape, so the sound quality is pristine. A couple of the highlights include “Somewhere,” which has Hendrix teaming up with Stephen Stills; there is an angry version of “Hear My Train A Comin’,” that is sizzling; “Let Me Move You” doesn’t exactly fit this set, as it is a soul jam that is sung by sax player Lonnie Youngblood, but it does give a good idea of what it might have been like to have Jimi in your band, as his lead guitar is way out front and unmistakable; and “Inside Out” is a driving instrumental that originally only had Jimi and Mitch Mitchell playing together, but then Hendrix added a guitar and bass overdub. It’s hot. These aren’t some tie-dyed tunes that are attempting to relive the 1960s. Hendrix was so far ahead of everyone else, this stuff remains cutting edge. I grew up listening to him a lot, so over the last 20 years I’ve gotten away from his music. I just got burned out. But when you put on a Hendrix disc and listen with a critical ear to the sonic experimentation this guy was into, and what he was able to achieve with inferior technology – it’s mind blowing. There continues to be nobody that sounds like Jimi Hendrix. I went back and threw on “Blue Wild Angel,” which is the production version of Hendrix playing the Isle of Wight Festival in 1970, with Mitch Mitchell and Billy Cox. They rip into “God Save The Queen” followed by “Sgt. Pepper’s Lonely Hearts Club Band” before a British audience numbering 600,000. It’s an epic performance by a God. Part of the Hendrix legacy is that there were no guitar solos before him. He is the guy, along with Eric Clapton, that put the rock guitar out front and scorched history forever. He also popularized the wah-wah pedal, and was instrumental in developing the use of amplified feedback as a desirable technique. He was only on top for four years, putting out four records, but the out-takes and orchestrated jam sessions have led to an additional 12 albums, plus all the live bootlegs that have already been released. It’s frightening to think about what Hendrix could have achieved if he hadn’t died prematurely. Born on November 27, 1942, he was only 27. I space off how all these rock-n-rollers manage to get themselves dead, so here is the short version on Hendrix. He aspirated on his own vomit and died of asphyxia. He was in London hanging out with his girlfriend Monika Dannemann, and was having trouble sleeping around 4:00 a.m., after having taken amphetamines earlier in the evening, so in typical Hendrix fashion, he took nine of Dannemann’s Vesparax sleeping pills, which are intended to be taken in half-tablet increments, so Hendrix took around 18 times the recommended dosage of this powerful German sedative. 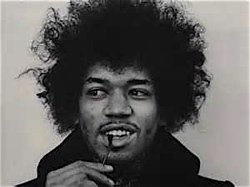 This entry was posted in Music and tagged Band of Gypsys, Jimi Hendrix. Bookmark the permalink. It’s a nice fantasy to entertain but I seriously doubt Hendrix could’ve kept up his groundbreaking pace. As far as I’m concerned, Hendrix peaked with the Band of Gypsys. P.S. Btw, Hendrix was murdered.